I’m an adventure junkie! If there’s something new that I haven’t tried, I’m immediately drawn towards it. That’s why over the past few years, I’ve said yes to various Spartan or Warrior Dashes, jumped out of not one but two very good planes, SCUBAed for Florida lobster, experienced hang gliding over the Everglades, and explored glacier caves in Alaska. For the adventure that I am about to tell, I tried to do it at least a half dozen times before this particular morning. I was always cancelled the night before because of weather. I have to admit that I had not understood the sport of hot air ballooning; it is very fickle. I had always observed hot air balloons with awe, but I had no idea just how unpredictable this mode of transportation was until I did it myself. So, on my umpteenth try, I got the final confirmation call. Boy, I was eager to put by curiosity to rest very early the next morning in a random field in South Miami. So with a handful of others packed into the gondola like sardines, our pilot, Mark, started to heat up the balloon little by little. Just about the time that I felt that my hair was going to start on fire from the gas flame that heated the air for our flight, we gracefully left the grass, missed a few trees, and glided past power lines to a destination only the wind knew. Floating nearly at 2,000 feet for a peaceful 90 minute flight, we traveled with our ground crew driving below. As I mentioned, prior to this experience, I did not know that the expected final destination of a hot air balloon flight is always a guestimate. It is a mere calculated estimation as to where the wind will take you, how many obstacles will be in the way, and if there will be an empty field, yard, or park available. So in essence, what goes up, must come down, but where that’s anyone’s guess. So, that is why the ground crew in hot air ballooning is so essential. If fact, Mark’s ground crew drove in a big, Texas sized truck with a flag flying off the back for easy spotting from the balloon. They would scope out the possible landing spots along our flight. Once the decision was made to land and confirmed via radios, our pilot set us down gently without hiccup in an empty farm field while the ground crew of 3 adults scrambled to grab the balloon so that it wouldn’t fly away while we climbed out. We all exited the gondola in need of some water and extra deodorant from the hot ride. I think all were delighted with the experience; I know I certainly was happy with the ride. But, that was not the end of the experience. From that farm field, the crew loaded up the heavy gondola and balloon and drove us to a small campsite for a ballooning picnic. There the team educated us on the origins of hot air ballooning in France as well as an important tradition. 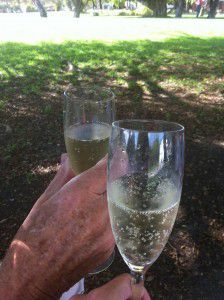 Given that hot air ballooners don’t know where they are going to land, they figured that bringing a bottle of champagne as an offering for trespassing on someone’s land would be a pretty good idea. So likewise, we cracked upon a bottle of champagne with fruit, cheese, and sausage toasting to soft winds and gentle landings. If you have ever hot air ballooned, I’d love to hear your feedback by commenting below. 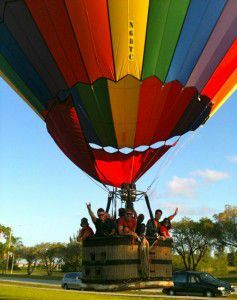 If you are interested in trying the same hot air balloon ride, contact Balloon Miami. As always, keep posted on my next adventures by connecting with me on Facebook, Twitter, Google+, and YouTube. Here’s to more good times and good stories! !